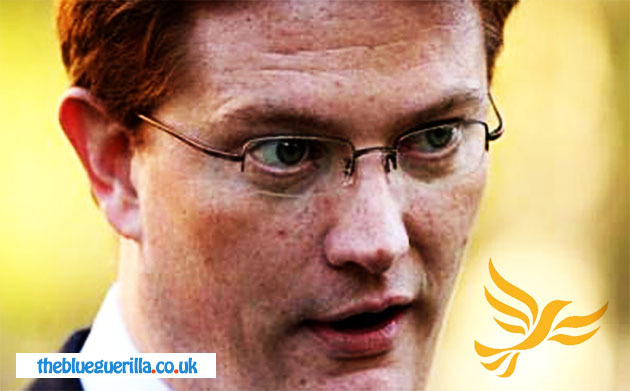 TheBlueGuerilla: Danny Alexander 'Positioning Himself' for Leadership Bid. Danny Alexander 'Positioning Himself' for Leadership Bid. Nick Clegg may be saying that he intends to lead the Lib Dems through to 2020 but, TBG understands some people in his party have other things in mind and heading the list of those is the man currently responsible for the government's deficit reduction plan. Yes, Danny Alexander is now fast becoming the man being tipped to take over from Nick Clegg. In a move that's going to go down like a lead balloon with Tim Farron and those on the left of the party TBG has learned that Alexander is "already positioning himself" for a Leadership election in the event of his party not being in government after 2015. Alexander's main rival is Vince Cable but given that he's already older than their previous eldest leader, Menzies Campbell, and the fact that Alexander's seat is one his party's safest at Westminster it seems that even though the future may not be bright, it may at least be Danny. In addition to Cable's age being against him its also understood that his wife is against the idea too. When asked earlier today about media speculation Rachel Cable said that not only was she not keen on such a move but insisted that she was also a "big fan" of Nick Clegg.